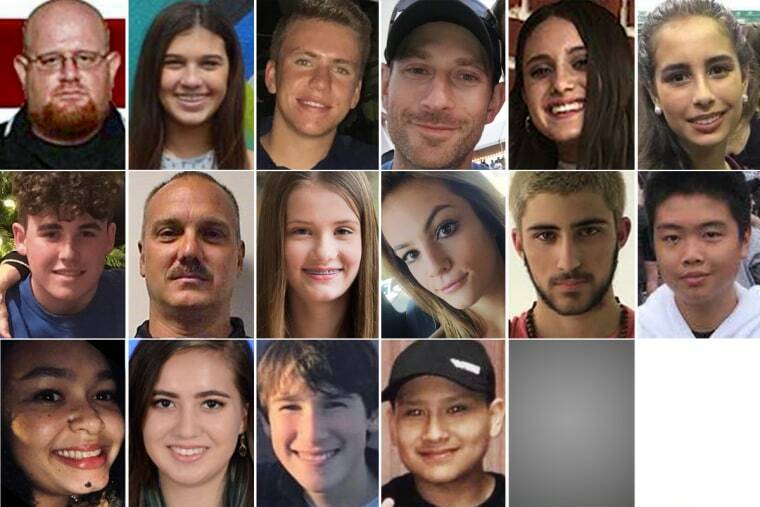 16 of the 17 fatal victims of the Parkland school shooting. Alyssa wanted to become a lawyer as well as a professional soccer player, according to her mother Lori, who attended a vigil for victims on Thursday. She was a member of the school’s Parkland Soccer Club, who honored her in a Facebook post. “Alyssa Alhadeff was a loved and well respected member of our club and community. Alyssa will be greatly missed. Our thoughts and prayers go out to her family and all the other victims of this tragic event,” the post read. Beigel was one of several adults at the school who died while protecting students from streams of gunfire. According to the Sun-Sentinel, Beigel was shot and killed when he unlocked his classroom door in order to allow students to take refuge from the gunman. He was mortally wounded while trying to re-lock the door. Martin was described as “a very funny kid, outgoing and sometimes really quiet,” in a description posted by his older brother, Miguel, on GoFundMe. According to the Sun-Sentinel, Miguel also paid tribute to his brother on Instagram, stating, “Words can not describe my pain. I love brother Martin you’ll be missed buddy. I know you’re in a better place. Duques forever man I love you junior!!! R.I.P Martin Duque!” The caption was accompanied by a photo of Martin. Nicholas was a swimmer at the school who had committed to competing at the college level at the University of Indianapolis at the beginning of February. He was named by the Sun-Sentinel a second-team All-County swimmer in Broward County for his 100-yard freestyle time. His brother, Alexander, was grazed by a bullet in the back of his head. Feis died while using his body to shield students from bullets as the gunman opened fire. Broward County Sheriff Scott Israel, a personal friend of Feis’, noted that the Marjory Stoneman Douglas High School alum and former football player was a beloved protector of those in the community. "When Aaron Feis died — when he was killed, tragically, inhumanely — he did it protecting others, you can guarantee that, cause that's who Aaron Feis was," Israel said. "The kids in this community loved him, they adored him. He was one of the greatest people I knew, he was a phenomenal man." Guttenberg was a dancer who was described as the “life of the party” during a statement made by her father, Fred, at a candlelight vigil on Thursday. “My heart is broken. Yesterday, Jennifer Bloom Guttenberg and I lost our baby girl to a violent shooting at her school. We lost our daughter and my son Jesse Guttenberg lost his sister. I am broken as I write this trying to figure out how my family get's through this,” Fred wrote in a Facebook post that was also made on Thursday. Guttenberg’s Facebook page has been made into a memorialized account and features photos of her posing with friends and family. Hixon came from a family with an extensive background in the military and served in the U.S. Navy. He also was a huge influence on the school’s wrestling team and was killed while patrolling the school’s campus as part of his job as security specialist. Douglas wrestler Karlos Valentin described the impact that Hixon has on his wrestlers in a statement made to the Sun-Sentinel. “Coach Hixon, for me, was a father figure,” said Valentin, a senior heavyweight. ”We were pretty much with him six days a week – three-to-four-to-five hours. His loss was just terrible." Luke was described as a “good kid” who “never got in trouble” by his grandparents, who live in South Carolina. Cara was a beach-lover and dancer whose death was felt deeply by her aunt, Lindsay Fontana. According to The Baltimore Sun, Loughran’s death was also felt by Baltimore Ravens running back Alex Collins, who received Irish dance training at the Drake School in Florida. Loughran was one of three dancers at the school who also attended Douglas. Gina's family described her as a hardworking student with a keen sense of humor who "melted each heart with an infectious smile that light up a room." "She was a kind spirit, always eager to lend a helping hand," the family said in a statement. "Gina will be missed not only by her family, but by everyone whose life she touched." Gina was also a member of Douglas’ winter guard on the school’s state-champion marching band, which was scheduled to perform at a regional competition in Tampa on Saturday, according to the Sun-Sentinel. The winter guard’s instructor, Manuel Miranda, wrote a Facebook post about Montalto on Wednesday. “My heart is broken into pieces. I will forever remember you my sweet angel,” Miranda wrote. Joaquin was a hip hop and sports lover who became a naturalized American citizen in January 2017, after moving to the United States from Venezuela at the age of 3, according to the Sun-Sentinel. "He's just a goofball. He's the only kid you'd know that would dye his hair bleach-blond, walk around school, put some tiger stripes in and just be unique. He was a unique soul," said Tyra Hemans, 19, who said she had been friends with Oliver since freshman year. Alaina was extremely devoted to her local community, according to a statement made by her family via the Latter-day Saints Living publication. According to her cousin, Jake Maisner, Meadow was the youngest member of her family and enjoyed spending time with her family, the ­Sun-Sentinel reports. Maisner also added that his cousin had planned on attending Lynn University in Boca Raton after she graduated. Page also noted that Helena was planning on going to college next year. According to a GoFundMe page setup by Schachter’s family in the wake of his death, Schachter played the trombone and baritone as a member of Douglas’ marching band. Last September, Carmen was named one of 53 National Merit Scholarship Program semifinalists in the county. She was one of 10 Douglas students to qualify as a semifinalist, according to The Eagle Eye, the school’s student-run news magazine. Carmen was also a piano student who had performed on Saturday at Broward College for the South Florida Music Teachers Association Spring Festival. Peter was a member of the JROTC program at Douglas. His cousin, Aaron Chen, told the Miami Herald that Peter was last seen wearing his uniform and holding the door open so that people could escape. He had planned on celebrating the Chinese New Year with his family.